Pandora is a harsh and unforgiving planet to the unwary. What chance do eight video game critics have against the insane brutality of Handsome Jack and his minions? Perhaps these review scores will earn them a stay of execution. Only a stay, mind you; Handsome Jack isn't exactly known for not killing people, at least not for extended periods of time. Sooner or later, once he gets bored with his diamond horse, he's going to kill a person. It's his thing. Can you really blame him? Those pretzels were incredibly stale. I've played several hours of Borderlands 2 myself, and as far as I'm concerned Gearbox could have made the game Handsome Jack threatening you over the intercom for four hours while you're tied to a chair in a completely white room and I still would have bought it. Hell, they could integrate Kinect. Thankfully Gearbox did more than that, and it seems to have pleased reviewers, at least the ones not too busy waiting for Halo 4 and Call of Duty Black Ops 2. Borderlands 2 is Gearbox's chance to properly execute on a concept that only barely came together in 2009's Borderlands. Borderlands was, in hindsight, propped up largely by a hope and a prayer. Taken only by its design, it's a collection of parts from multiple genres - the quests of an MMO, loot influenced more by action RPGs like Diablo, and shooting out of, well, a shooter. None of these parts were exemplary, and they were even combined in what could be affectionately labeled a haphazard way. But the combination was new, and it was glued together by virtue of a coherent visual style that mimicked hand-drawn art. It felt new, which compensated for how patchy everything felt. 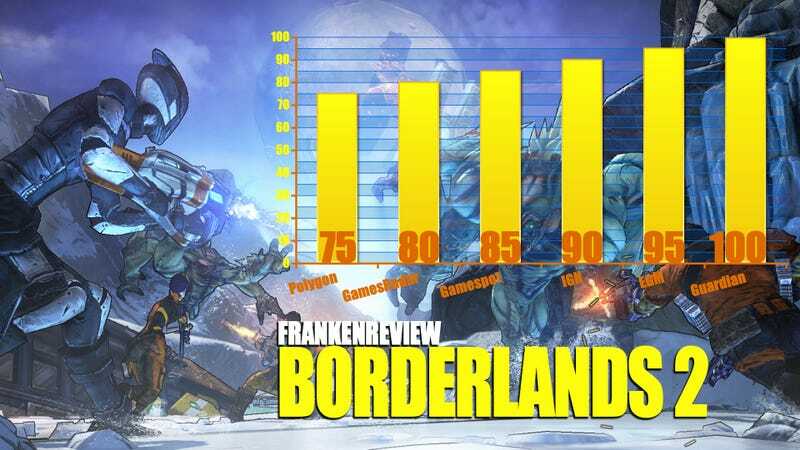 Gearbox has taken a fresh look with Borderlands 2 at the often weak connective tissue linking the pile of divergent ideas that defined its predecessor. The story is developed and surprisingly thoughtful, and systems link together more. The result is a better game in almost every regard and, interestingly enough, a more ambitious one. However, a clearer vision from the start doesn't prevent Borderlands 2 from straining in several design directions at once. Borderlands 2's main hook is its focus on "shooting and looting." To that degree, the sequel offers significantly more choice and customization than its predecessor. Guns are broken down into brands and damage modifiers. So, for example, a gun made by Hyperion will have a more high tech feel, whereas another line may provide punchier gunplay. The damage modifiers—fire, acid, and electricity, among others—all factor in heavily when selecting the best tool to take down enemy types. It provides a strong sense of strategy to how to approach a mob of hostiles. Though the early stage weapons lack certain tactility, there's a heft to higher-level guns that's truly satisfying. Similarly to how the sidequests build upon the writing Gearbox became known for with the first game's DLC, Borderlands 2 also expands upon other parts of the game in smaller, but still significant ways. From more options to how you sort missions, to easy ways to mark and sell loot, to an always present mini-map, the entire interface is simply a lot more user friendly and intuitive. Sadly, though, little has been done to improve the driving component of the series. Outside of a few quests that require you to use a car, the vehicles feel largely underutilized and not all that valuable outside of getting you to destinations a lot quicker. Borderlands 2 is a shooter first and foremost, but it'd be awesome to see smarter mission design that takes advantage of them in, say, the way Halo does with its vehicle levels. Even so, they offer a change of pace from the rest of the game's shoot and loot cycle. Another element that gets a nice boost? The enemy AI, which took its fair share of knocks in Borderlands for predictability and a lack of advanced behaviors. Sure, you'll still catch 'em with their pants down at times, but there's an impressive leap here with the way enemies move through environments and work together, and the fact that Gearbox does both while offering up a host of creative variants per type is a real boon for the series. This does create some definite difficulty spikes when playing through solo, but considering the degree to which this game shines in its notably improved co-op play, it shouldn't be a massive setback for folks as they play through. ... there's really only one thing that you need to know about Borderlands 2. It's a tough, stylish, emotional ride through everything that made Borderlands 1 such a great game. Pick three friends, span the character classes, and get to killing. You won't be disappointed. As a $30 impulse buy, priced about the same as games like "NASCAR Unleashed," I wouldn't have a problem recommending Borderlands 2 as a fun diversion. At twice that price, though, I think it's fair for players to demand the whole magilla – cutting-edge development, engrossing campaign gameplay, scads of downloadable content, a rich social media/community experience, sharing of loot and gear and online multiplayer modes that keep you and your friends coming back until the next version of the game comes out. And Borderlands 2 misses on enough counts so that I not only didn't joy puke, I didn't even get a tiny bit of mirthful bile in my throat. It may be the game for you, but if you're in the market for a new FPS, I'd at least counsel waiting to compare it to Black Ops 2, due out Nov. 13, or Halo 4, which is slated for a Nov. 6 release.